I said at the last Board meeting that the State funding cuts could be covered with 1.3 mills of property taxes, and that the rest of the funding needs driving the levy were a matter of local choice. The latest information from Governor Kasich's Biennium Budget Proposal has rendered this statement incorrect - very much so. The Ohio Office of Budget and Management has released more detail about the adjustments to the Personal Property Tax (PPT) Reimbursement, which I explained in the earlier article, "A Bullet Dodged." The cut is significantly larger than expected. Districts which don't rely much on the PPT Reimbursement, meaning that less than 2% of their total funding comes from the PPT reimbursement. For these districts, the PPT Reimbursement program is over - they'll get no more money from this program. In Franklin County, Bexley and New Albany fall into this category. All other districts. This is obviously where we fall, as for us the FY11 PPT Reimbursement of $12 million represents 8% of our $152 million in total funding. For such districts, the PPT is phased out at a rate of no more than 2% of total funding each year. How long the phase out will take varies for each district, with the period being longer if the PPT Reimbursement is a large fraction of total fund. For example, Marysville Local Schools receives 16.5% of its total funding from the PPT Reimbursement (because of the Honda plant), so at a reduction rate of 2% more each year, it will take eight years for their reimbursement to end. Within the scope of our most recent Five Year Forecast (Oct 2010) - which extends to FY15 - our funding for PPT Reimbursement will be a total of $17.6 million LESS than projected. It was already all but certain that even with the passage of the 6.9 mill Permanent Operating Levy this year, there would have to be another levy on the ballot again in 2013. We're already deficit spending, with our cash reserves diving toward zero. A 6.9 mill levy this year will slow the cash burn, but not end it - and that was true before this PPT Reimbursement cut was announced. Our Five Year Forecast already had a much less aggressive phase-out of the PPT Reimbursement built in, plus assumptions that the next contract with the unions would be for three years, with base pay increases of 1% in FY12 (actually 0.5% because the unions have agreed to a base and step freeze for calendar 2011, meaning step increases automatically resume Jan 2012), 1% in FY13, and 1.25% in FY14. Although it would be beyond the scope of a three year contract, the Five Year Forecast assumes 1.5% base pay increases for FY15. Note that the passage of SB5 changes all these assumptions about compensation agreements with the unions. I'll not attempt to address them in this article as there is still much to absorb about the final form of this law. 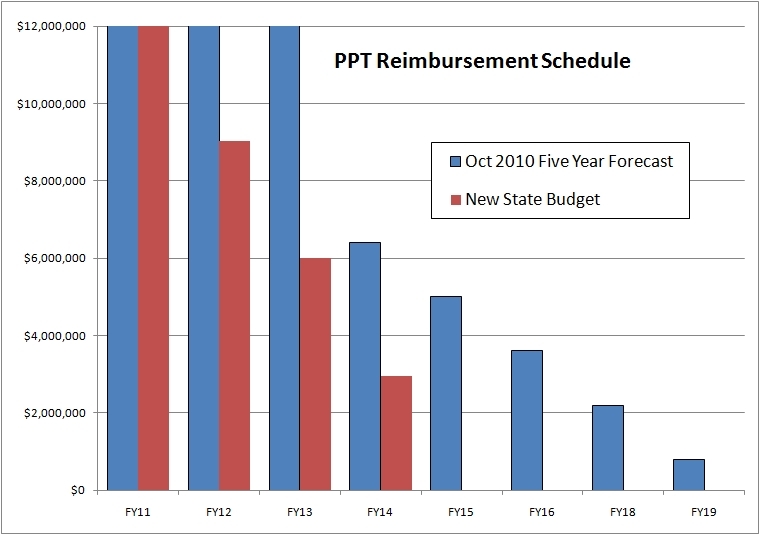 My unofficial, personal analysis of the numbers - ignoring the effect of this PPT Reimbursement phase-out acceleration for the first pass - is that: a) if we stick to the spending plan in the current Five Year Forecast, then the 2013 levy would need to be on the order of 8.8 mills to keep us from running out of cash before FY15 (when yet another levy would be needed). If we pile on this acceleration of the PPT Reimbursement phase out, the 2013 levy would need to be on the order of 14 mills. That's how big a deal this is. 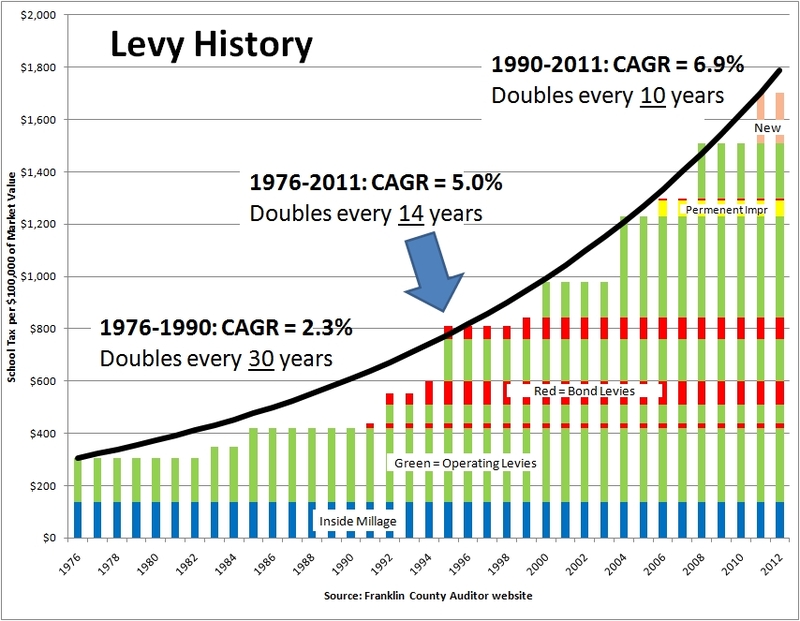 So if we assume that the 2011 levy passes, and another one is put on the ballot on 2013, and it passes, how much do we have to cut back on spending to keep the 2013 levy from being larger than say 7 mills? In other words, after passing 7 mill levies in 2011 and 2013, we would still need to take a total of $25.6m out of our FY12-FY15 spending plan to stay solvent. But note that this still isn't a spending cut. It's a significant reduction in the rate of spending growth. 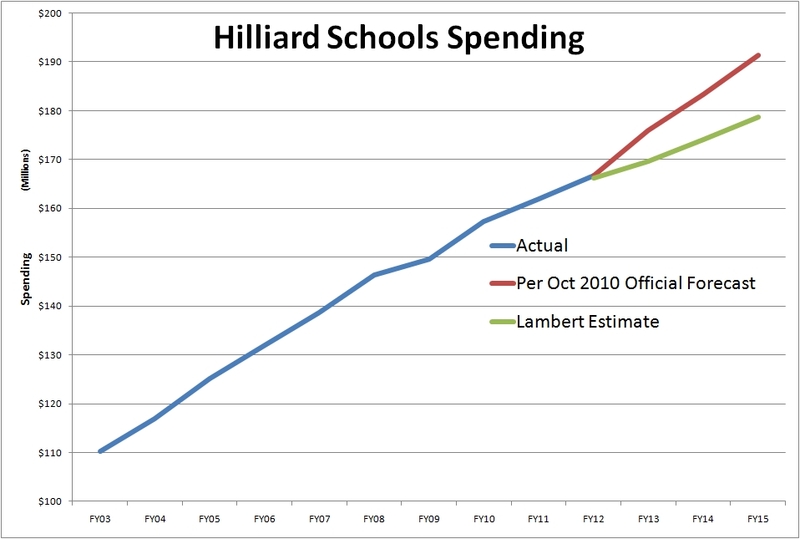 Our total spending as a district would still increase at a rate of 2.5% per year. The question is whether even that is affordable to the people of our community. Comments in Regard to the "Cut List"
Below are the comments I made at the School Board meeting last night in regard to item D1 on the agenda, the list of things that would be cut in the event the 6.9 mill Permanent Operating Levy is not approved by voters on May 3. The premise of the opening sentence of this resolution seems to be that we are in the position of impending cash shortfalls solely because of what we have been so far told about the proposed biennial State budget. This seems more a political viewpoint than a statement of fact. The $3m in state funding reductions being proposed by the Governor associated with the Tangible Personal Property Tax reimbursement could be covered with a levy of no more than 1.3 mills. We are asking the voters of our community to consider a levy five times that size. In other words, we can hang 1.3 mills of blame on the state government, but the other 5.6 mills is the consequence of decisions made within our District, as well as the municipal governments we overlay. The one-time Federal Stimulus money we received – along with the one year compensation freezes contributed by the teachers, staff and administrators – allowed this levy vote to be delayed for a year, but did not change the fundamental economics of our district. Secondly, a parent made a comment to me that I thought was particularly poignant: If we are in the business of educating kids, why in the process of selecting what to cut from our substantial list of optional programming, would we choose to eliminate the gifted services to our brightest students while maintaining an extraordinarily rich and expensive set of high school extracurricular programs? Is there some sort of formula for weighing the relative worth of extracurricular activities versus educational services to kids who would benefit from those services, be they gifted or have learning disabilities (which are not mutually exclusive conditions). It would undoubtedly be a difficult and uncomfortable process to pick and choose which extracurricular activities to drop or scale back in order to free resources for the gifted programs. That doesn’t mean it shouldn’t be done – with appropriate community input. Lastly, I have a concern about the use of the word “automatic” in the second paragraph of the resolution. We don’t yet know what the final State budget will look like, and whether the changes in our state funding will be more or less than portrayed to this point. It could be that some of these cuts are not necessary if the levy doesn't pass, and it could be true that some of these cuts will be necessary even after passage of the levy. I understand not wanting to leave our most junior teachers and staff – who are the first to get laid off in most cases - “on the bubble,” not knowing whether they have a job next year or not. But passing this resolution now does not help that much – their fate will not be known until after the May 3 election regardless. I THEREFORE MAKE THE SUBSIDIARY MOTION TO POSTPONE INDEFINITELY THE ACTION ON THIS RESOLUTION UNTIL WE HAVE MORE DEFINITE INFORMATION AS TO THE FUNDING WE WILL RECEIVE IN THE UPCOMING BIENNIAL BUDGET. My motion died for the lack of a second. A long discussion followed, which by itself is a victory for the governance process. I respect the opinions of my fellow Board members, as I hope they respect mine. The vote was 4-1 to adopt the resolution, with me casting the sole NO vote. My concern is that if the new State Budget whacks us even harder than has been revealed so far, we could end up in a situation where the people pass this levy, and then some or all of these cuts have to be made anyway. That may be understandable to the growing number of folks in our community who are paying more attention to public school economics and politics, but I expect that most of the voters would feel betrayed. The recovery from that could take years. And this is still only nibbling at the edge of the real strategic issue - the unsustainable rate of growth of our spending on compensation and benefits. The Audit & Accountability Committee picked up on this very early in their discovery process, as one should expect would happen when a smart and experienced set of financial professionals examined the numbers. When Dave Lundregan said that it's time that the people of our community engage in the "hard decisions," this is what I believe he was talking about. He's exactly right. Thanks to Justin Gardner (his comments here, as well as video) and Mike Harrold for coming forward to address the Board. Community input is crucial during the process, and the School Board meetings are an important place to make your feelings known. Even if you don't get an immediate response, your comments can influence future considerations and decisions. The informal meetings are another important venue for dialog. A Coffee with the Board is being scheduled, and it's looking like the evening of April 20 will be it. If you haven't already cast your levy vote by then, this is a great time to ask questions that might help you make your decision. Today's Columbus Dispatch reported the long-awaited details of the the district-by-district funding proposed by the Kasich Administration. So how did we do? It seems as expected. It could have been much worse. For FY11 (the fiscal year we'll finish on June 30, 2011), our Foundation Aid - shown as "Unrestricted Grants-in-Aid" on the Five Year Forecast - will be $33.996 million. A table just published by the Ohio Department of Education shows the FY11 number to be $33.115 million. I'm not exactly sure of the reason for this $881,000 difference (and will ask our Treasurer for clarification), but for now will assume that the $33.115 is the number we should be working with for this analysis to keep things apples-to-apples. So according to this newly published table, we should expect to receive $33.127 million in FY12, or essentially the same amount as for FY11. The method for calculating this interim funding mechanism - the Governor says he has bigger plans for the next budget - is explained here. If this interim plan holds up through the legislative process, it puts us right on projections. And for FY12 the State Foundation Aid is projected to increase by about $1.5 million to $34.626 million. When our last Five Year Forecast was prepared in Oct 2010, Treasurer Brian Wilson estimated that we would see a 10% reduction in State Foundation Aid for FY12 - on the order of $3.4 million. I've been concerned all along that the cut would be deeper. However this funding proposal appears to keep us pretty much whole. So far, the news is good. As I reported earlier, it looks like the $12 million we had forecasted to receive in FY12 and FY13 is going to be reduced by $3 million each year. I think this one blind-sided all of us, although Mr. Wilson's radar had recently picked up that this might be a place were cuts would be applied. He was right. So in aggregate, his forecast was pretty much right on in regard to the net impact across these two categories. I don't know how many times this needs to be said: This was one-time money that gave our District the little extra cushion needed to show a tiny positive year-end cash balance for FY12, which in turn allowed the delaying of the next additional operating levy until this year. Of course, the calendar 2011 base pay freeze and step increase postponement accepted by the teachers, staff and administrators contributed as well. This was a nice gift from the Federal Government (which of course was just piled onto the massive national debt), but it's over. The Five Year Forecast was built with that knowledge, and does not assume any additional Federal Stimulus dollars will be coming out way. The Revenue side of our Five Year Forecast looks like it lines up pretty well with the current funding information we're getting from the State. That's a relief. But we can't rest easy. All we've seen so far is the Governor's proposal - we still have the legislative process ahead of us, so it could be several weeks before we know the final numbers. The last time around, Governor Strickland's first cut with his so-called Evidence Based Model didn't stand up very well. It led to the creation of the Education Challenge Factor as a mechanism that allowed funding to be tweaked district by district. The addition of the ECF significantly changed the number for many districts. Will there be such a 'tweak' this time? If so, will it be a big one or a little one? There are winners and losers in this scheme, as there is with any change in the school funding system. Cleveland Municipal Schools is a big winner, and will get $15.7 million more in FY12 than the $398 million they received in FY11, which is a 3.9% increase. But also in Cuyahoga County: Beachwood, Cuyahoga Heights, Independence, and Orange schools will see their State Aid reduced to zero. Here in Franklin County, the big winner is Columbus City Schools, who will see $6.3 million (2.9%) added to their FY11 State Aid of $218 million. No districts in Franklin County get zeroed out, but Upper Arlington will lose more than half (54%) of the $3.3 million they were granted in FY11, and New Albany will lose 39% of their $2.4 million. The explanatory document that accompanied this proposed funding table says that 421 districts will see an increase in funding for FY12 under this plan. That means 192 districts will stay the same or see cuts. Whether it gets tweaked will depend on the relative legislative power of the 421 districts (who tend to be urban and rural) versus the 192 (who tend to be suburbs). Notice is hereby given; there will be a SPECIAL meeting of the Board of Education of the Hilliard City School District on MONDAY, MARCH 28, 2011 at 7:00 P.M. located at the Hilliard City School District Administration Annex Building, 5323 Cemetery Road, Hilliard, Ohio. The meeting will be held in regular session to discuss budget reductions, personnel actions and any other business that may be lawfully considered. Note: If you haven't already done so, please read my earlier article on Governor Kasich's first Biennial Budget. I've been asked by several folks what I think of the Governor's proposed budget for the next biennium. The only answer I can give right now is "stay tuned" - we haven't seen the final deal yet. From here, the budget goes to the General Assembly to be translated into law, and it is possible that they will make some adjustments. However, one must presume that the Governor would not submit a budget without talking over key numbers with the leadership of the General Assembly, so I don't expect a lot of changes. But politics can be strange and unpredictable, so we'll have to see. In years past, the General Assembly has enacted various reductions of property taxes. If you examine your property tax bill, you'll see lines labeled "10% Rollback" and "2 1/2% Rollback." These are exactly what they say - reductions in your property taxes. But property taxes are revenue sources for local governments such as counties and school districts, not the State. So to keep the local governments "whole," the State of Ohio sends grants to those local jurisdictions to make up for the lost property tax revenue. There was some fear that these two reimbursements would be phased out. Luckily, that seems not to be the case. The impact would have been to increase our property taxes by 14%, yet not have generated one more dime of revenue for our school district (because we have already been getting reimbursed). So far, it seems as through these reimbursements have been retained, and that's a good thing. But our luck is not so good with another kind of property tax - the Tangible Personal Property Tax (TPPT). This is a tax on things like business equipment, machinery used in manufacturing, and inventory, and is also paid to local governments, including school districts. Governor Taft signed legislation in 2005 that eliminated the TPPT, but simultaneously implemented a "phase-out" program that would replace the TPPT revenue with grants from the State of Ohio, much like the real property tax rollbacks I mentioned above. However, there is one big difference with the TPPT tax repeal - the law specified that the reimbursements would be 100% of the lost TPPT revenue until some point in time, then be reduced a certain percentage each year until eliminated. Under the current law, the 100% reimbursement period lasts through FY13, then is gradually reduced until eliminated after FY18. This is no small thing. Our annual funding from this reimbursement program was expected to be $12 million each year through FY13 (as documented in the Five Year Forecast), before entering the phase-out period. The Governor's Budget intends to accelerate this phase-out. Specifically, in FY12, it looks like our TPPT reimbursement funding will be about $9 million, and in FY13 it will be about $6 million. So in just those two years, we'll get approximately $9 million less in state funding. The picture in later years is less clear, as they are beyond the scope of this biennial budget. But the expectation is that the pain will continue for several years to come. Our largest chunk of funding from the State of Ohio is "School Foundation Aid." This amounts to around $33 million/yr, or about 21% of our total funding. The budget documents as submitted by the Governor have the following to say about this item: "GRF (General Revenue Fund) appropriations in the school funding line items ... 200550 (Foundation Funding) increase by 1.4% from FY11 to FY12, and by 1.5% from FY12 to FY13" (see page D-186). That sounds like good news, but remember that the State Foundation funding is not passed out evenly across all school districts. Since Hilliard is viewed as an affluent district by the State Board of Education, we get a smaller per-student funding amount than the many low income districts in Ohio. In my opinion, we'll be very fortunate if our Foundation Aid funding stays in the ballpark of where we are right now. As part of the massive Federal Stimulus Program enacted over the past couple of years, our school district received $2.5 million in FY11 and will get another $1.8 million in FY12. This money was first granted by the Federal Government to the State of Ohio, who then decided how to distribute it to Ohio's school districts. The method they choose was to apportion this money is same percentages as each district's share of the School Foundation Aid funding. This money was very handy, in that it played a big part in being able to postpone asking the people of our community to pass another property tax levy. Some folks take what I think is a bizarre point of view about this one-time money, which is that because the State of Ohio didn't continue this level of extra funding on its own, there has been a funding cut. It seems to me that a much more rational way to look at this money is as a one-time gift that helped in the short term, but doesn't do anything to address our fundamental fiscal situation. Regardless of how you characterize this, it's $4.3 million that we used to fund normal operations that is not going to be in the revenue stream going forward. We knew this, and it was built into the current version of the Five Year Forecast. So, at this stage of the process, it looks like we might be about where our Treasurer projected we would be, with State funding down about $3.3 million/yr compared to FY11. That doesn't mean things are hunky-dory. We are still spending $5 million more than our revenue in FY11, and are projected to spend $12 million more than revenue in FY12 - ignoring revenue from a new levy. And we still have to see what happens to our Foundation Aid funding. This is a continuation of a conversation started here. As anyone remotely involved in public education in Ohio knows, the Ohio Senate rapidly moved Senate Bill 5 - the legislation meant to radically reform the laws under which public employee unions operate - from Committee to the floor, where it was passed with little debate. The text of SB5 as amended and passed is available here, along with a summary generated by the Senate. The next step is for the Ohio House of Representatives to consider the Bill. If they choose to pass it without modification, the Bill could be on the Governor's desk in a matter of days. I'd be surprised if this happens - there will almost surely be amendments made by the House, forcing a conference between the Senate and House to resolve differences. So there's still a lot of politics to happen before any law is created. But I may be wrong. A good friend and much better observer of politics than I feels SB5 will be passed by the House without modification and signed by the Governor, leaving the real battle for the budget process, which starts soon. Right to Strike: SB5 takes away the ability for public sector workers to strike (Sec 4117.15 line 8393), and imposes significant penalties on those who do so illegally. The threat of a teacher strike is the nuclear specter that hangs over every negotiation between a School Board and the employee unions. Some claim that the proof that the current collective bargaining laws have been working is that there have been few teacher strikes since it was implemented. I think another explanation is that for most of the 30 years since those laws were passed, our economy was in one of the longest periods of growth and prosperity in American history. Therefore, school boards during that period felt confident that they could win sufficient support for additional tax levies to underwrite the deals the unions negotiated. No sense daring the teachers to strike if that's the case. Those days are gone, and we're now in much tougher times. Does that mean it's impossible to negotiate a new collective bargaining agreement that fits the times? That's the fear. Clearly our employees have shown a willingness to work a year without a base pay increase, and to postpone the application of step increases by half a year, and that is appreciated. But that's not a new contract, and we don't have a clear sense yet of what the teachers and staff are looking for in their next contract, which has to be negotiated this year. We all know that the State of Ohio has a huge revenue-vs-spending gap to fill, reportedly on the order of $8 billion, and we've already been told to expect a multi-million dollar cut to our annual funding from the State. I'm concerned that our current estimate of a 10% funding reduction is overly optimistic, and that as a district viewed to be affluent by the lawmakers, we might be hit with cuts that are double that. So some painful choices are going to have to be made. How will the impact of our down economy be apportioned between employees and taxpayers? Certainly the rate in which our expenses are growing - which really means the rate in which our cost of compensation and benefits is growing - has to be reduced significantly simply because our revenue is being significantly reduced. There are only two knobs to turn: 1) the number of people on the payroll; and, 2) the per-capita compensation and benefits costs. Neither is adjusted without anguish. SB5 takes the nuclear option off the table while we try to work this out. I think that's a good thing, because a strike is first and foremost harmful to the children of our community. SERB will then appoint a mediator to try to bring the parties to agreement. Interestingly, at this point, both SERB and the school board would be required to post "conspicuously" the last offers from both the union and school board on the school district web site. This gives the public a chance to review the offers and let their feelings be known while negotiations are still underway. I think this is a good thing. 4117.14(C)(1) Any time after the appointment of a mediator, either party may request the appointment of a fact finder. This person is appointed by SERB from its list of qualified persons. The fact finder will gather information and make recommendations for resolution of the remaining disputes. The fact finder is not permitted to disclose these recommendation to the public. If either 60% of the union membership or 60% of the "legislative body" - the school board - reject the fact finder's recommendations, the recommendations are publicized and the process moves to the next step. Again, this creates an opportunity to hear feedback from the community. The school board, or a committee of the school board, conducts a public hearing at which both the school board and the union are required to explain their positions with respect to the report of the fact finder. At the conclusion of the hearing, the school board votes to accept either the board's last offer, or the union's last offer. There is some understandable concern on the part of the unions about this last step. After all, why would the school board ever choose to reject its own last best offer in favor of the last best offer made by the union? All I can say is that strange things happen in politics. It's no small thing that this section of the Bill requires that this last step take place in the full bright light of public scrutiny. There is little question that such a hearing would be attended by hundreds of union members, and probably hundreds of community members. It would be the same kind of scene as that we've been witnessing at the Statehouse this week. I'm not sure exactly where we would hold such a hearing in Hilliard - one of the high school gyms? The point is, would a school board stick to its last best offer in such a situation, or yield to the union position? We won't know until we get there --- and I hope we don't. So with or without the right to strike, both parties need to bring empathy and reasonableness to the bargaining table this time around. I don't think the public has a lot of tolerance for strong arm tactics by either side right now, especially when it hurts the kids. When it comes to the kids, they expect us all to be on the same side. the results of an evaluation of the teacher, which might be in the form of a peer-review process negotiated with the union. I'm a big fan of merit pay. More accurately, I'm a big fan of compensation systems that give each employee a chance to be rewarded with something meaningful to that employee. The trick is to find out what specific reward would motivate each individual, and find a way to provide that reward when an individual achieves certain agreed-upon results. Unfortunately, we tend to think money is the only reward appropriate in an employment situation - it's certainly the easiest to administer - and I think that leads to the creation of ineffective and expensive compensation programs. 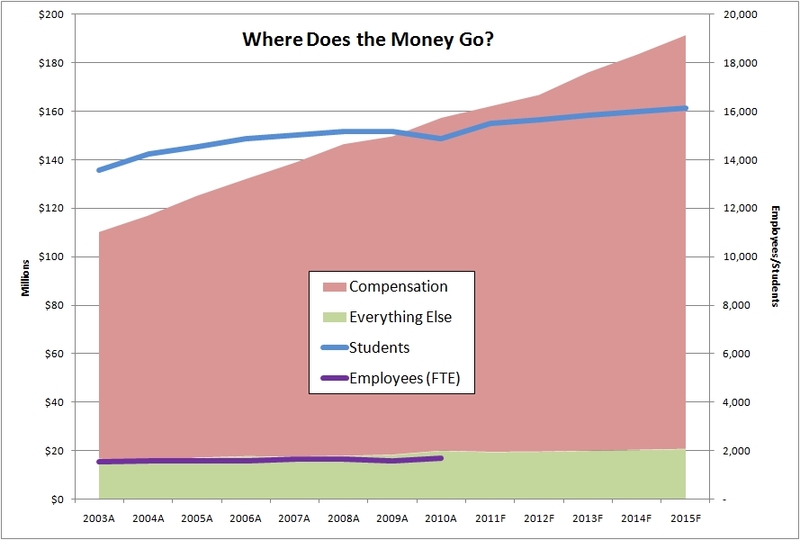 I think it's safe to say that most folks don't go into teaching for the money. But they don't go into it to fill out forms or teach to the test either. Nor do they want to be expending more energy managing classroom behavior than they do imparting knowledge. If we want to effectively reward the teachers, maybe we need to start by figuring out ways to diminish the bureaucracy and behavioral issues they have to deal with, and let them spend more time teaching. Then yes, let's measure their performance objectively, and reward appropriately. Let's look beyond money as being the only form of reward. But this SB5 fails to change any of this. Both the unions and the management will continue to attempt to resolve performance/reward discussions with a contentious dialog about pay and benefits. The reality is that if SB5 passes, we're going to enter an extremely painful period of trying to figure out how to turn this ambiguous law into a working collective bargaining agreement (CBA) with the unions. You can bet that the lawyers and consultants are licking their chops about this one. With the stroke of a pen, this law will create a whole new industry to advise school boards and unions how to architect and negotiate radically new CBAs. I'm not so sure SB5 isn't really a jobs bill for the lawyers and consultants. The current CBAs with the teachers and staff specify that the employee pays 10% of the contribution necessary to fund our self-insured plan. Right now, the total contribution is $473.74/mo for single coverage, and $1,279.08/mo for family coverage, meaning that the employee pays $47.37/mo and $127.91/mo respectively. The original version of SB5 required employees to pay 20% of the cost of health insurance coverage. This has been reduced to 15% in the amended bill that was passed by the full Senate (Section 3313.202(B)(1), see line 3872). Current CBAs will remain in force until their expiration (12/31/11 in the case of ours), but this says that no matter what is negotiated into the next agreement, the employee contribution to health coverage is going to increase by at least 5%. In dollars, that would be around $25/mo more for single coverage, and $65/mo more for family coverage. I don't know what the Senate was thinking on this - that insurance costs are somehow isolated from the rest of the negotiation process? Does anyone doubt that sometime during the process of negotiating the compensation components of the next CBA, that someone on the union side will say "we want X to help cover the cost of increased insurance contributions"? In principle, I think this is a good thing as well. If a school board finds itself in the regrettable position where folks have to be laid off, doesn't it make sense to cut the people who are least effective? This conversation is far from over. Regardless of what the House decides, or what gets presented to the Governor, we're going to have another go at it during the budget process. 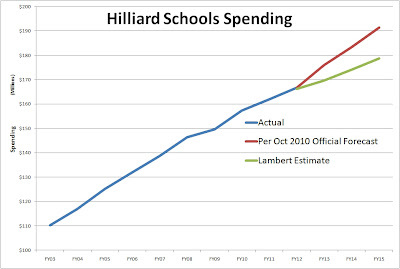 After all, it was through the last budget bill that Governor Strickland implemented most of his changes to school operations, notably the so-called Evidence Based Model. Nor is this some haphazard political process. The Republicans control both houses of the General Assembly as well as the Governor's seat, and they are executing a well-planned strategy to stage these bills in preparation for the budget battle. But as we saw with the Senate vote on SB5, things are not going to necessarily go according to party lines, and our lawmakers are going to individually weigh the political benefits vs the political cost of their votes. So who knows how it's going to turn out. I have no problem with the teachers, police officers, firefighters and other unionized public employees going down to the Statehouse and making their views known. And I respect those who support the Bill doing the same. Free Speech one of our most cherished Constitutional rights, and many have died to create and to defend that right. I just wish those folks could do so without resorting to insults and childish behavior.